The U.S./Mexico border has been called “a leaking wound” by U.S. Poet Laureate Juan Felipe Herrera. In South Texas, that wound bleeds immigrants, drugs and violence. 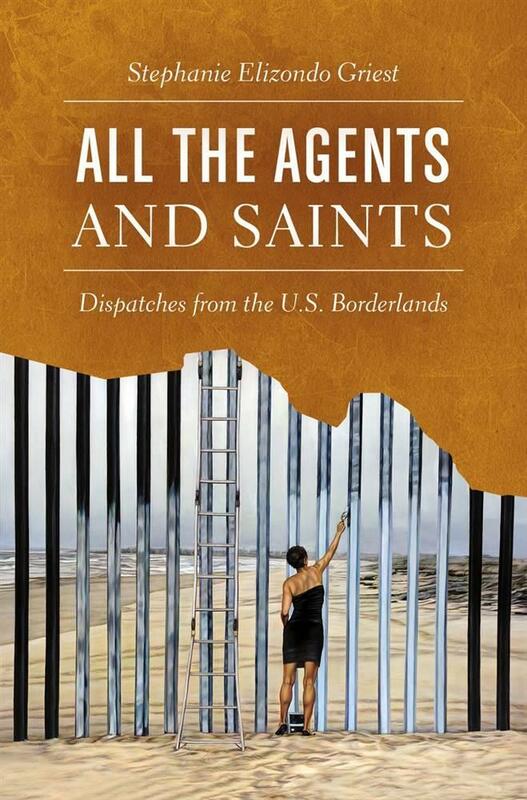 Author Stephanie Elizondo Griest spent a decade looking at all aspects of the border – religion, drugs, immigration -- and not just in her native South Texas, but all along the U.S./Canadian border. And despite being separated by 2,000 miles, Elizondo Griest found that the northern and southern borderlands have more in common than not. Norma Martinez: There are so many different characters and so many angles that this book takes. It’s almost as if every chapter could branch off into its own book. You want to learn more about this woman with the magic tree. Tell us more about her since I just brought her up. Stephanie Elizondo Griest: Oh, the magic tree! This is a lovely woman named Estela Palacios, and she lives in Concepcion. It’s probably about 100 miles north of the border. I heard about her from Santa Barraza, the very famous painter and muralist. She had mentioned that there was a tree that spoke, and it had leaves that could heal. So I thought, ‘All right, let’s go check out this tree!’ So my buddy Greg and I drove down to Concepcion, and Estela greeted us, and she’s like, ‘go talk to my tree!’ So we did. We walked over to it. It was very cold that day – South Texas basically shuts down when it’s below 50 degrees, including, it turns out, our trees! Our trees don’t talk when it’s below 50. But we pressed our ears against the trunk, and quite to my shock, I could hear a little trickling water. I hadn’t actually listened to a tree before, so perhaps all trees sound like trickling water. But at the moment, it seemed like it had some significance. At first it seemed like an interesting, kind of quirky thing, but it really took a different turn when we were leaving that she made a mention about not being able to drink from her water well. I said ‘what?’ She said, ‘Oh, no, 14 years now I have to drink bottled water from Premont.’ ‘What’s happening to your well?’ ‘It’s poisoned. All the ranchitos around here, we can’t drink from our water.’ She says that oil tankers come late at night, and they dump their tanks across the street. This was not something I was able to verify. But it was clear she was not drinking from her water well. And certainly South Texas is surrounded by various forms of pollutants. I went in thinking it would be sort of a charming story about South Texas spirituality, but I came to realize something really intense which is that women like Estela Palacios who are living off the grid often don’t get any help from the government. There are certainly activists that come out and help out, but often they intercede – they ask for divine intervention. Saints are the only ones that listen. Trees are sometimes the only ones that listen in South Texas. That is what I found time and time again as I traveled for 7 years all throughout the border. You actually were able to go with a Border Patrol agent in Falfurrias. And while you were there, you asked to go with a Border Patrol agent to look for the many bodies that are left behind with so many of the people who are crossing over who don’t make it. You actually are there with a Border Patrol agent when they discover a body, and I want to have you read an excerpt from your book. It’s a very graphic description of death. But I found it a very striking piece of writing. To further introduce this piece, this was the summer of 2012, which is the year that South Texas truly became a graveyard. 129 bodies were found in Brooks County, Texas, that year. During the summer they were finding a body or two a day. And I just so happened to be with the Brooks County Lead Investigator of the Sheriff’s Department when they got the call in. He turned to me when they got the call, and he said, ‘Do you have a weak stomach? If you don’t, you can come with me on the retrieval.’ And so I did. I smell the body before I see it. The scent wraps around my face like a hot towel, burning my eyes and singeing my throat. It is violent and rancid and frightening. I start breathing through my mouth instead of my nose, but that transfers the sensation to my tongue. Now I am eating death instead of smelling it. My eyes drift toward the midsection of the body. At first, I think it is wearing a child-size T-shirt, but then I see the belly has bloated to colossal proportions, so engorged it has exploded along the jean line. Slick black beetles crawl in and out of its crater. It’s the face, though, that unravels me. From the nose down, its remaining skin is black and leathered, but the top half is strangely untouched, the color of a bruised peach. There are deep holes instead of eyes, and the mouth is open as if silently wailing. The hair is streaming all the way down to what used to be elbows, thick and black and damp. It’s a woman, I think, and with that realization comes the overpowering urge to scream, to continue the sound her own mouth was making, … to continue the collective wail they all must have been making before winding up inside the three-ring binders of Brooks County, Texas. I bite my lips until they bleed. And this woman, her image haunted you for quite a while. And you actually were trying to come up with a story for her. Yes, she became the prism through which I saw everything for about 6 months. And that didn’t end until I finally wrote her out of my “eye prism” during a snow storm when I was living in upstate New York. I’ve actually interviewed dozens and dozens of undocumented workers and their families, but this is a story that really haunted me. I didn’t know how it ended. Well, I only knew how it ended. I had no idea how it began. And she was so decomposed by the time we arrived to her. We didn’t know if she was Guatemalan, Honduran, Chinese. They could only estimate that she had been out for three days. They couldn’t find any identification on her. So I just tried to track what could have potentially been her journey. This book does not necessarily focus on the southern border but on the northern border as well…but there’s actually an excerpt in your book that I want you to read as well, that sort of marks that transition from the southern to the northern border and the similarities. Before arriving here, I didn’t think the northern borderland could differ more starkly from the one where I grew up. Temperatures, for starters, tend to be 60 degrees apart. South Texas feels like a large wet dog is sitting on your face. The heat and humidity are that oppressive. The North Country is more like a cat hissing and scratching you. ….And when I step into the car and in 20 minutes reach a bridge that requires a passport to cross and descends into a shockingly different economic strata, I realize I have been here once before. …And when I read about people getting arrested for smuggling ‘aliens’ by speedboat and drugs by snowmobile, I realize that I am yet again living on an edge. In other words, when I stare around this remote new world, I realize that I am home. In the northern border, you’re going to the US/Canadian border, but there is one particular community that you are focusing on in this book. Can you tell us a little more about them? That would be the Mohawk nation of Akwesasne. Some of you may recognize that nation. They were portrayed in the film “Frozen River.” I came to find out that Mohawks cannot stand that movie. It portrays their nation first of all, as very bleak, very dreary, when actually it is very upbeat, empowered community. So I drove out to Akwesasne within a few days of arriving to the North Country for the year and was just struck with déjà vu. It seemed like every story I had found over 7 years of reporting in South Texas, I found the exact mirror equivalent happen in the Mohawk nation on so many levels, from trafficking... It’s a very small number of people who are trafficked across -- probably double digits a year that are caught, I should say. They have similar economic forces in play there. But what I was more struck by, and something I really wanted to investigate, was how Mohawks have attempted to preserve their culture even though it was threatened so many times in so many nefarious ways, in particular by Indian residential schools. That was a system for over 100 years in which native children all throughout the United States and Canada were taken forcefully from their families and put into these boarding schools often run by the Catholic Church. Their hair was shaved, and they were beaten for speaking their indigenous languages, beaten for speaking Mohawk or Cree. A lot of these children were abused. It’s a devastating legacy. It almost ended the use of Mohawk. But fortunately there are, again, activists. Activists are really what are saving communities in both borderlands. Activists have attempted to resurrect the language. They’ve even started a school called the Akwesasne Freedom School, and that’s done entirely in Mohawk. When you’re writing specifically about the religion and the spirituality, you kind of find yourself with an inner conflict between you as a writer, a journalist, an investigator, and yet that part of you that is still very basically Catholic. So tell us about that internal struggle. The Aztecs coined this term “napantla.” That’s the state of living in between. What it means to live between worlds, what it means to walk between worlds. I guess I’ve just tried to come to a sense of peace that I straddle many, many different worlds, not only between the Mexican world and the White world because I have biracial parents. But also the fine line between journalism and activism, the fine line between an agnostic and a Catholic, the fine line between a cowgirl and a really metropolitan girl that has to be in the city. I walk between all of those lines, and I think that’s one of the many things this book taught me is to just understand that is what it means to be a member of the borderlands. We are living in the fissures of it. My intention with this book when it began in 2007 was to try to find a way to fuse. And I feel that I did just by recognizing that is a struggle we all share in the borderlands. Not only the southern borderlands but the northern borderlands. We’re all trying to strive for what it means to live in the land of in between.